The giant Tirawa impact basin straddles the day and night boundary on Saturn's moon Rhea in this view from the Cassini spacecraft. The ancient basin is 5 kilometers (3 miles) deep in places, as measured in NASA Voyager images. The basin is 360 kilometers (220 miles) across. The prominent bright splotch to the southeast of Tirawa is ejecta from a fairly fresh crater. This feature can be seen at much higher resolution in PIA06648 . This view of Rhea (1,528 kilometers, or 949 miles across) reveals terrain slightly to the east of a similar Cassini view, released earlier (see PIA07539 ). The sunlit surface in this view is principally on the leading hemisphere of Rhea. North is up and rotated 13 degrees to the left. 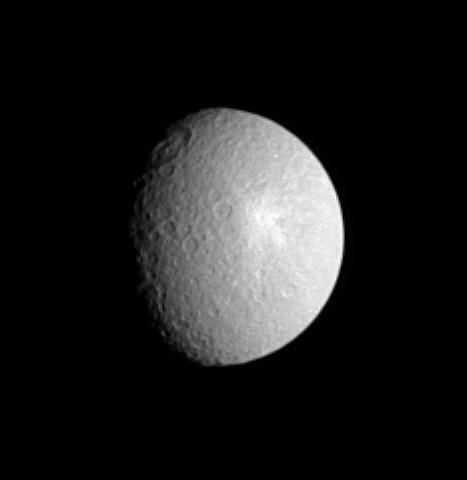 The image was taken in visible light with the Cassini spacecraft narrow-angle camera on Aug. 13, 2005, at a distance of approximately 2 million kilometers (1.2 million miles) from Rhea and at a Sun-Rhea-spacecraft, or phase, angle of 50 degrees. Resolution in the original image was 12 kilometers (7 miles) per pixel. The image has been contrast-enhanced and magnified by a factor of two to aid visibility.